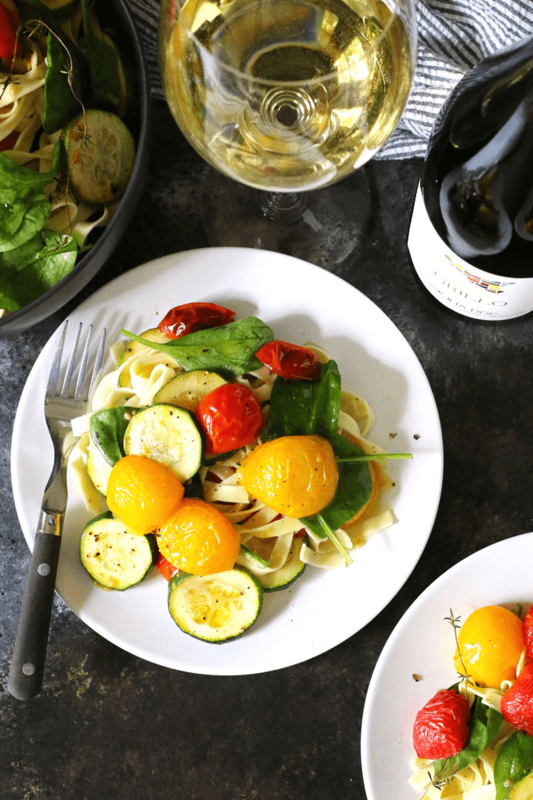 This roasted tomato zucchini spinach fettucini recipe is the perfect way to use your farmer’s market purchases and end-of-summer garden’s bounty. Pair it with a glass of Grillo for the perfect weeknight dinner! This post is sponsored by Wines of Sicily. My love of Sicilian wine and my opinions are my own. Every other Sunday, all summer long, there is a farmer’s market in the park down the street. It feels like a treat to have the bounty of summer at my doorstep. During my visit there this weekend, I picked up a handful of veggies and herbs. The zucchini and tomatoes looked so good that I just couldn’t resist. We have spent the majority of summer grilling burgers and brats; so much so that I have been craving vegetables. 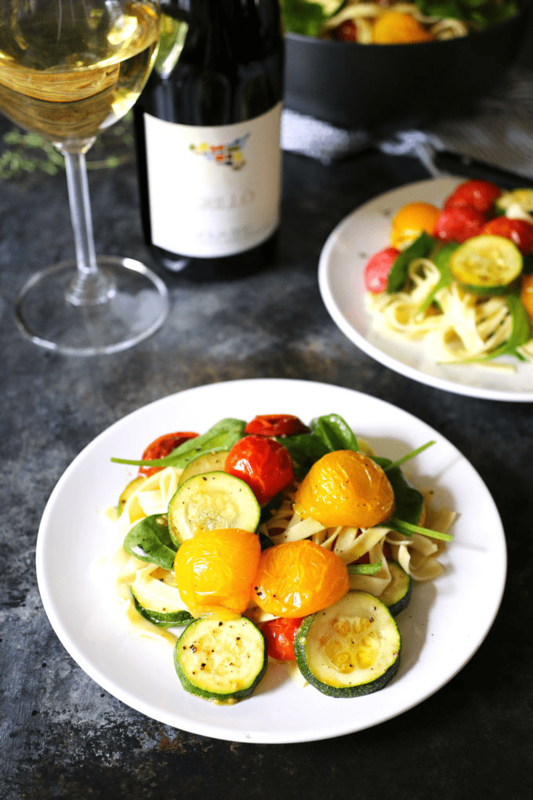 Perfect time to make a meatless meal like this roasted tomato zucchini spinach fettucini recipe. Paired with Grillo, it makes the perfect weeknight dinner. After my trip to Italy with Wines of Sicily, I found myself searching out Grillo at every restaurant I visited. 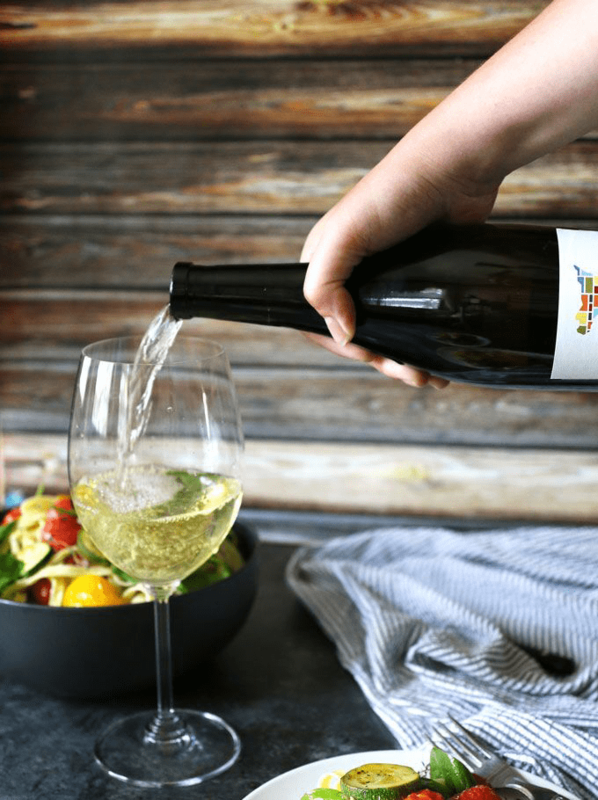 If you’re not familiar with Grillo, it is a light white wine and perfect for summer and grilling. It is one of the traditional grapes of Sicily and can be found at restaurants and on the shelves of stores. This easy pasta recipe can be made in 30 minutes which is one of the reasons it is perfect for weeknights. Turn on your oven and set a pot of water to boil to get started. Halve your tomatoes and slice your zucchini. When picking tomatoes at the farmer’s market, I recommend a cherry or grape variety but Campari tomatoes would also work well. Add the tomatoes and zucchini to a large bowl and gently toss with some of the olive oil; I usually use my hands to do this so that I don’t damage the delicate tomatoes. 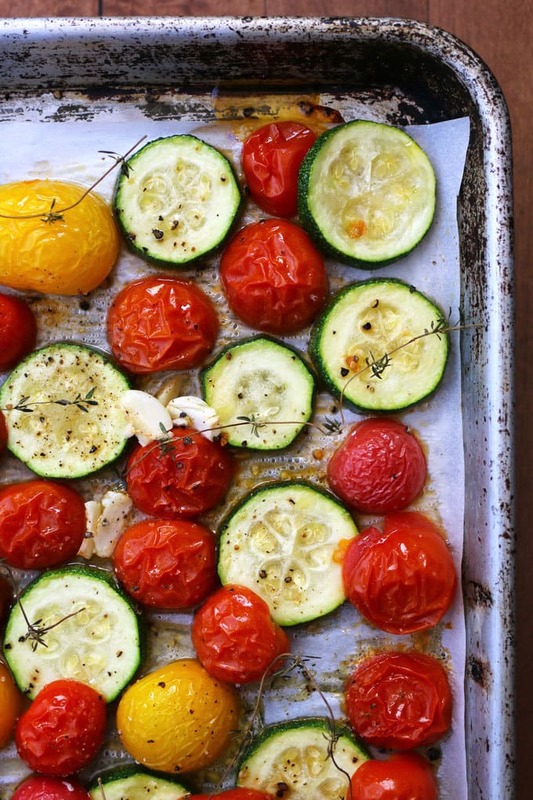 Place the tomatoes and veggies on a parchment lined baking sheet and sprinkle them with sea salt and pepper. I add a couple of smashed garlic cloves and sprigs of thyme for added flavor. Set aside the bowl and don’t clean it just yet – you are going to use it to toss everything together at the end. Place the vegetables in the oven on the top rack to roast. While the tomatoes and zucchini are cooking, cook your fettucini. Fettucini doesn’t take long to cook, so keep an eye on the noodles. I found that 3-4 minutes is enough time to cook fettucini al dente style. Remember that bowl we set aside? It’s time to use it again. Put the spinach into the bowl and before draining the pasta water, pour some of the water over the spinach (one ladleful is enough). Drain your pasta, put it into the bowl with the spinach and add some additional olive oil. Right around this time, your veggies will be done roasting. Take the pan out of the oven and add all of the roasted veggies to the bowl. Gently toss everything together. 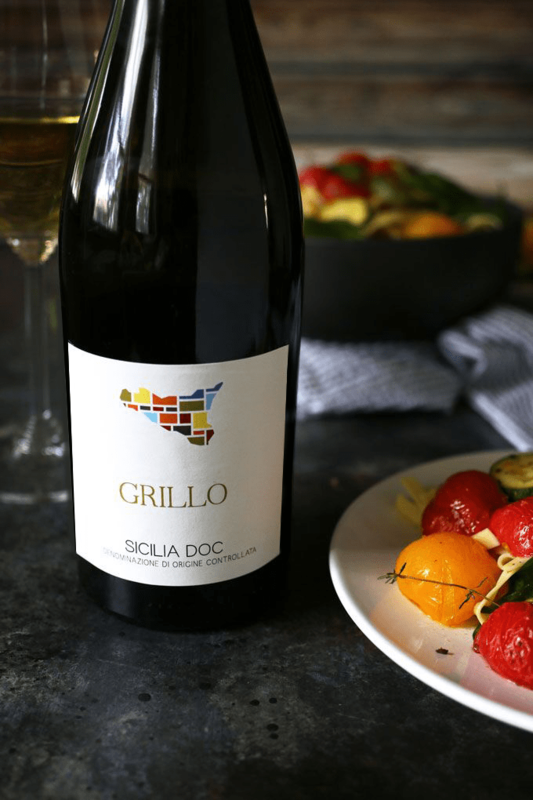 If you haven’t already, open a bottle of Grillo and get ready to eat dinner. 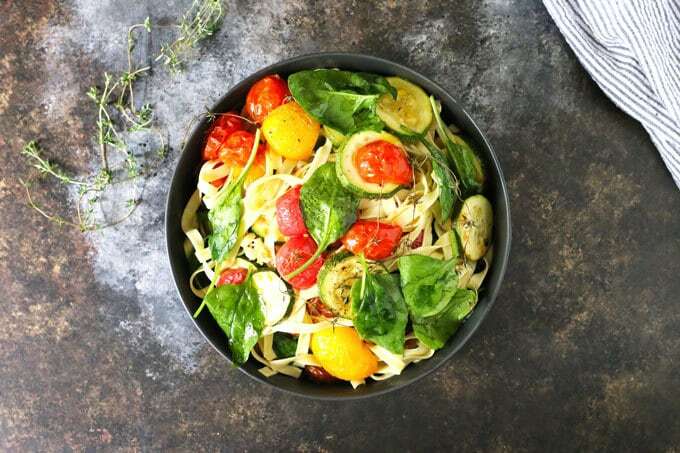 Serve your roasted tomato zucchini spinach fettucini hot. For more information about Grillo, Wines of Sicily and Sicilian grape varietals, check out their website. You can also find more information on Facebook, Instagram and Twitter. Preheat oven to 400 degrees and line a baking sheet with parchment paper or foil. Set a large pot of water to boil on the stove. Slice the tomatoes in half and the zucchini into 1/4 inch slices. Add them to a large bowl and add 3 tablespoons of extra virgin olive oil. Gently toss with your hands. 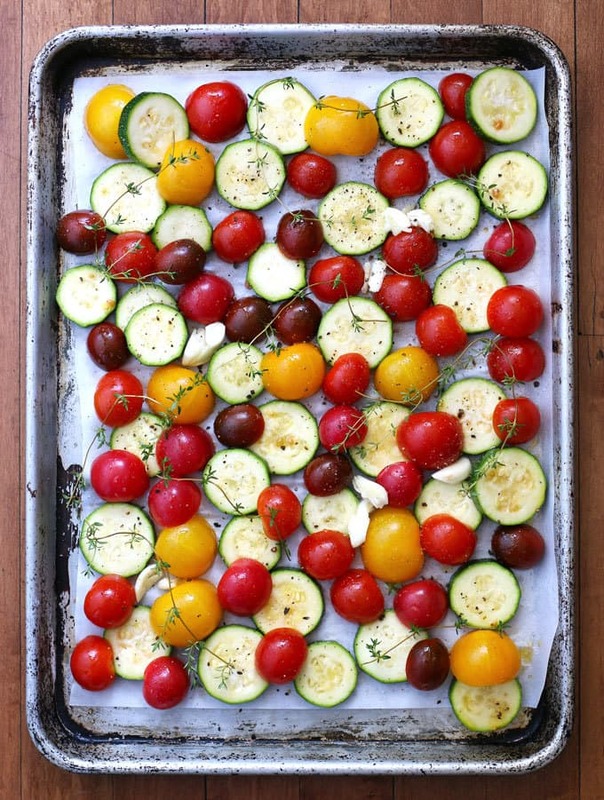 Place the tomatoes and zucchini slices on your prepared pan and set the bowl aside. Make sure the tomatoes are skins up. Add the smashed garlic cloves and several thyme sprigs to the pan. Sprinkle with salt and freshly ground pepper. Place the pan in the oven and roast the vegetables for 15 minutes or until the tomato skins have cracked. Remove from the pan from the oven. Place the fettucini noodles into the boiling water and cook according to the package instructions. Put the spinach into the set-aside bowl and add one ladleful of water from the pasta pot. Drain the fettucini in a colander and add it to the bowl. Add the last tablespoon of olive oil and the roasted tomatoes and zucchini to the bowl. Toss all ingredients together and serve hot. This is seriously the most fantastic fettucini recipe ever! Seriously the best fettucini recipe of the summer! This wine looks like it would be incredible with these roasted veggies. Can’t wait to try this pairing. What an amaaazing fettucine recipe! LOVE!!! This is a stunning dish, a perfect way to use summer produce! This is truly up my alley, and the wine? That is just a win win. What a great recipe and wine pairing! What a beautiful dish — you’re so lucky to have a farmers market so close! What a lovely meal, especially with a great bottle of wine! I know what I’m making with my veggies from the farmer’s market this week! Love everything about this!! 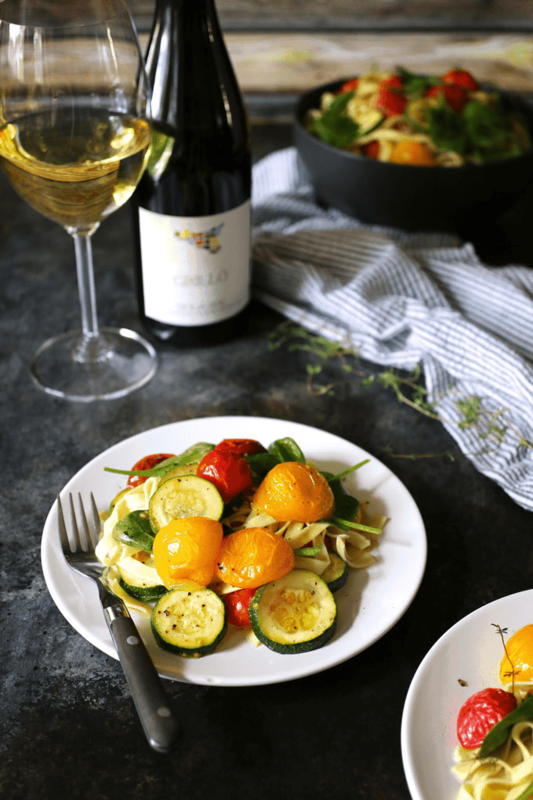 Those gorgeous fresh veggies, the crisp white wine… YUM! 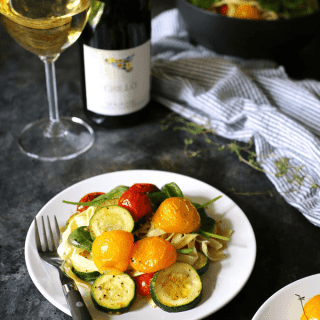 This fettuccine looks like it’s absolutely bursting with fresh summer flavor and a nice bottle of white wine just makes it better! Would love to try this out! Thanks for sharing!! Greetings from Dubai and have a great day! Just a lovely pairing of flavors for this dish! So fresh with these gorgeous summer veggies! I can just see my husband and I enjoying this meal in our courtyard with the wine too! I’m thinking this needs to go on the menu soon. I love the fresh flavor of all of these ingredients! This is quite possibly the most perfect summer pasta dish ever! Omgosh, this looks amazing! So many delicious ingredients in one dish. Om-nom-nom! Such a beautiful dinner. Love those roasted veggies! Next time you go to Sicily, can I get in your suitcase? What a great, fresh meal and a delicious wine to go with it! Loving all of those fresh veggies! I love roasted vegetables like that! Oh my word that’s an amazing dinner idea! Wow this looks fantastic! I didn’t see this until I used a zucchini and squash a neighbor gave me from his garden, but more are to come from him! My kind of dinner 😉 Thanks for sharing at this week’s Inspiration Spotlight party. See you again soon. Pinned & shared. Have you ever roasted your cherry tomatoes from frozen? Do they maintain their flavor? Hi Kelsey – unfortunately, I have never roasted frozen cherry tomatoes. I cannot say whether they would retain their flavor. I think you would be better off roasting canned tomatoes over frozen, but again, I haven’t done that either. Looks great and roasting in the oven makes it so easy!Thank you for sharing on Merry Monday! Hope to see ya next week! This is a beautiful plate of Fettucini covered with the wonderful fresh veggies! Hope you have a fantastic weekend and thanks so much for sharing your awesome post with us here at Full Plate Thursday. We hope to see you again real soon.